To celebrate turning 40 this year, 40 weird tales published over the past 7 years. And to think, when I was a kid, I thought 40 would be OLD. I don't feel old -- not yet, anyway. And I'm so glad I didn't wait until this year to start submitting my work for publication. That was the plan. I've been writing since I was 12, but I was never all that interested in getting my stories published. I always figured that was something I could do when I was old. Like 40 or something. But Mrs. Fowler changed my mind about that. Thanks to her encouragement, I started submitting my work for publication back in 2009, and in 2010, my first short story was published. After that, it became something like an addiction: seeing how many stories I could write and get published. This year, I sold the last of my short stories. That's right, folks, all 120 of them have found homes. And even better, the rights have reverted. 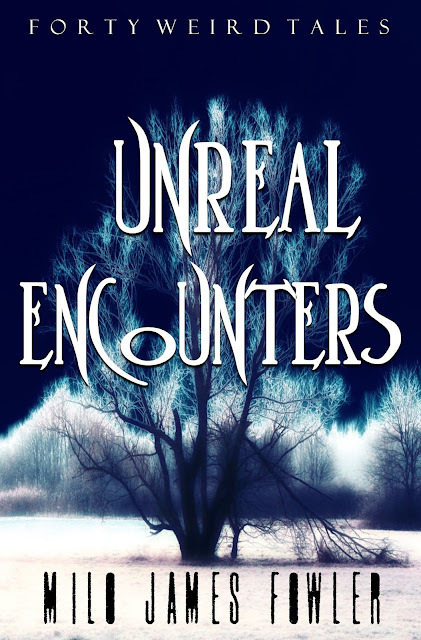 So now I can make them available in collections like Unreal Encounters, a Twilight Zone-ish batch of my weirder tales.